Many people take their trees for granted. Their reasoning is, if they are standing they must be in good shape. But many people do not realize that what might look like healthy branches, can actually be diseased and in their weakened state may weaken and break and cause damage to your property or home. In addition, dead or dying trees can especially pose a safety hazard. Here are some ways that you can protect your home, property and family from weak and damaged trees in your yard. The first step in protecting your property from falling trees or limbs is to seasonally inspect your trees. 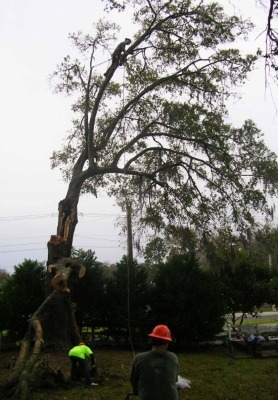 It is also important to inspect your trees after a big storm or many days of heavy rain. Some clues to an unhealthy or dying tree are: lack of leaves on branches, many branches falling, cracks or hollows in the trunk or mushrooms growing on the bark. If you have questions or concerns about any of your trees, Mr. Tree and Lawn Service can come out and inspect your trees for you. Pruning your trees is one of the most cost-effective ways to protect your home from falling limbs. The winter is actually the best time to prune many types of trees. Trees compete for light and grow towards the light. Often times, this means that some trees will start to grow toward your home, simply because there are not trees where your home is sitting. Hardwood trees such as sweet gum, poplars and oaks are especially bad about this. When these trees get too close to your home, it is especially hazardous. We offer a professional tree trimming services that will allow your trees to thrive while protecting your home. As much as we at Mr. Tree and Lawn Service like to preserve the trees on your property, sometimes the only way to truly protect your property is to cut a large part of the tree or the whole tree down. When a tree is dead or dying, limbs can easily drop with little encouragement because the rot is spreading throughout the limbs. A little bit wind in the right direction can be a big hazard if a tree is not healthy. Contact Gainesville’s top tree care professionals, Mr. Tree and Lawn Service to answer any questions you might have about trees on your property. Call us at 352-682-4444 or use the convenient “Contact” feature on our website.